The pursuit of a solid, all­-round midfielder has long been the obsession of a good many clubs across Europe — and Liverpool are no different. The days of Xabi Alonso and Steven Gerrard are gone, but, despite ample opportunity and spending, a true heir has not emerged just yet. 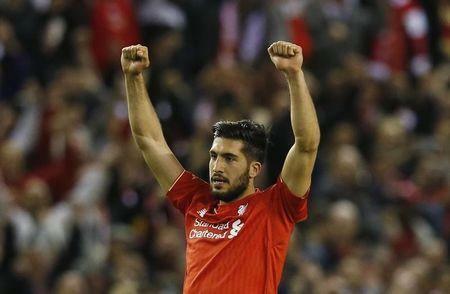 Step in, exciting prospect Emre Can. A graduate of the renowned FC Bayern München academy — which boasts recent successful pupils like Philipp Lahm, Thomas Müller and David Alaba — Can quickly rose through the ranks and, at long last, earned his senior debut in the win over FC Nürnberg, albeit as a result of the title being wrapped up already. The following summer Bayer 04 Leverkusen came knocking and after impressively establishing himself as a key first­ team player a move to Liverpool ensued. Rewind to last season, under then­ manager, Brendan Rodgers, the German international was used as a utility player throughout his first year in the Premier League, often out of position in defence, as the Reds continued to suffer despite a summer overhaul. As time went on he started to play more in his natural position and, in doing so, never looked back even when current boss Jürgen Klopp arrived. Since then, both Liverpool and Can have went from strength to strength which is no coincidence. Looking at the current options, the Merseyside outfit’s midfield isn’t exactly what you’d call star­-studded. Regardless of injuries, current captain Jordan Henderson has had a mediocre season, Lucas Leiva’s contributions appear to be limited and although James Milner and Joe Allen have stepped up, it hasn’t been glamorous enough. This is where Can comes into play. Among others, Klopp has improved the performances of a good many of his squad. When it comes to the core of our midfield, we severely lack any punch, both defensively and offensively. As evidenced in the second leg win over Villarreal, Can portrayed the very qualities he was signed for. Wherever you set your eyes on the Anfield pitch, the German machine was there winning tackles, recycling possession and blocking advances — you name it, he did it. It was a similar case going forward too. In the Bundesliga it was a common sight to see the bulky midfielder surge forward relentlessly and Villarral was no different. Can drove forward and his attacks continued to torpedo the rattled Yellow Submarine time­ after­ time. It’s no exaggeration to say this performance was his best in the famous red shirt — the only thing missing from his display being an assist or goal. The looming summer Transfer Window is almost certainly going to bring about reform, with the midfield likely to be altered, but it is of vital concern we allow this blossoming gem to continue to grow and live up to his hype. Some fans are already dubbing him as a future captain and although I’m not so sure of that, I can safely say a great Anfield future awaits him.